Tuesday night I spent a wonderful 90 minutes tasting and learning about chocolate. I attended one of the Little Tastes of the Dahlia, a series of educational (and fun!) programs held at the Dahlia Lounge by Tom Douglas. In each session Tom highlights an ingredient or topic he has an interest in, brings in specialists to educate the small group of attendees, and provides related beverages and small bites to go along with the topic. The sessions are packed with information and the samples and tastes are a great bonus. We started with a sampling of chocolates along with wine. The wine was selected by Pamela (last name unknown) who is now CEO of Tom Douglas enterprises, and also happens to have a wine background. She chose a 100% Tempranillo Rioja. It worked okay with the chocolate but I didn’t think it was great. As she discussed, wine pairings for chocolate can be challenging and with our selection of chocolate samples being all over the board, I think it was especially so this night. 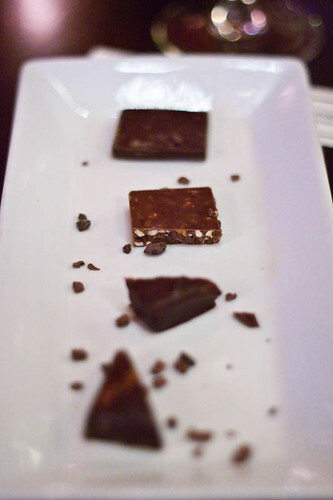 The chocolates we sampled were dark orange, hazelnut crunch, Madagascar ganache, ghost chili caramel and cocoa nibs. Each of the chocolates offered something a little unexpected, which is one of the things I like about Theo chocolates. And all of their chocolates are very chocolate-y, even their milk chocolate. In fact, their milk chocolate may be my very favorite of all milk chocolates. While we were sipping, tasting and taking notes, Autumn was filling us in on all kinds of information about growing the chocolate, the process to get it into the form we know and love, and all manner of other information about cocoa fat, cocoa powder and nibs. Our next tastes were of sipping chocolates. 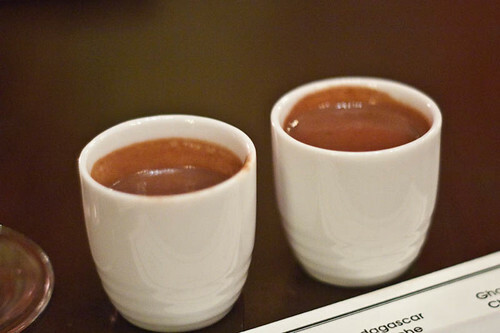 Presented in little cups about the size of a shot glass these were so rich and decadent that any more would have been too much. We tasted two samples but I don’t have the names of them. My favorite was one that included spices and chiles. Next we took a look at a savory use of chocolate. 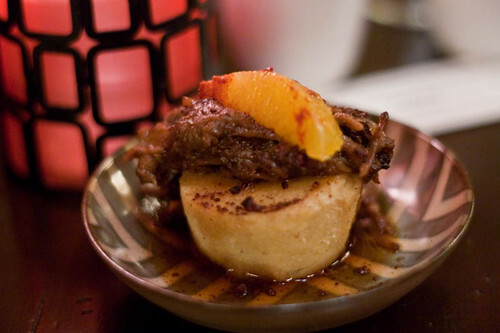 The chef at Dahlia Lounge prepared Chocolate-chile braised oxtail over orange scented masa cake. Pure heaven. The layering and repetition of flavors was amazing. The oxtail was prepared with dried chiles and cocoa then finished with shavings of the dark orange chocolate we had sampled earlier. The masa was scented and flavored with orange rind and the whole little dish was topped with a slice of mandarin orange. I really need to try to replicate this. 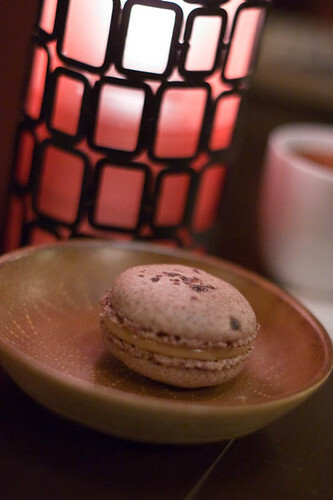 We finished off the tasting with "dessert", a cocoa nib macaroon filled with caramel and topped with a black volcanic salt. Also absolutely amazing. I almost hate to tell you about these classes as they always fill way too fast but the experience was so much fun that I have to share!